This project focuses on Illinois history during the early 1800s. 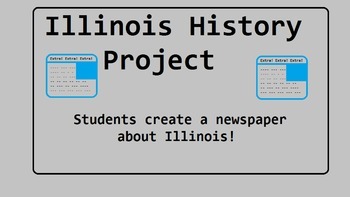 Students will research events and people from the time period and create a newspaper to display their information. Related products: French Villages in Illinois, Illinois State Capitals, Illiniwek in Illinois, Illinois Government Study Guide, Who is Illinois Government Parts 1 and 2, Paleo Indians in Illinois, Illinois Becomes a State, The Woodland Period and the Koster Site, The Kickapoo Indians in Illinois, The Iron Horse Comes to Illinois, How Decisions are Made in Illinois Government, Rationing In Illinois During World War II, Illinois Government Review Game, Illinois History Video Project.